Yes, the dunk of Xavier’s Jordan Crawford on LeBron James, a video of which was confiscated by Nike officials, has seemingly caused more of an uproar than if it were posted on YouTube with a press conference held by the “Chosen One” himself,presenting the clip for all to see. The worst part is that according to reports, it was actually LeBron who whispered into the ears of said officials right before they accosted various videographers around the gym. Because of the amount of “buzz”, Nike will easily find a way to make money off the video. Regardless, LeBron’s douche-baggery in the court of public opinion has increased exponentially. 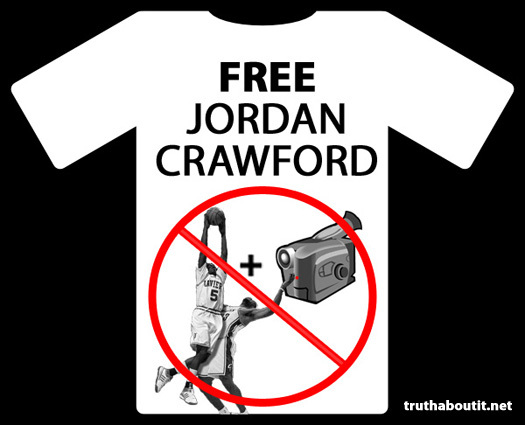 Jordan Crawford unfortunately goes from hero to victim when it was he who victimized LeBron. Me: Did you really dunk on LeBron? Jordan Crawford: Yeah, I dunked on him. Me: Where? JC: Right there. Me: You just came down the lane? Me: Where’s that rank in your career as far as things you’ve done. JC: It’s the top. No doubt. Crawford also spoke with Fox Sports about the dunk. If I had this shirt, I’d be wearing the hell out of it right now.